If you’re looking for a gravel holiday in the sun somewhere cheap and just a couple of hours flight from London, let me propose Mallorca. Just recently, I enjoyed the island’s extensive gravel trails at the inaugural Toros de Gravel event and in just one day of riding, decided I loved the place. Mallorca has long been known as one of the destinations for road cycling, whether you’re seeking a pre-season training camp, a break from the gloom and short days of the British winter or simply a holiday they can share with the family with the option of a few sneaky rides. Up until my visit a couple of weeks ago I’d never actually been, despite it being pretty high up on a list of places I’d like to visit. The reason was simply that I’d heard the weather wasn’t entirely reliable until around April – too long for me to wait before I escape for a winter break. When I was invited over to Toros, I couldn’t believe my luck. Billed as an end of season get together, the idea was for like minded people to converge at Sineu outdoor Velodrome (which just so happens to be next to an outdoor pool and cafe), where they could go on several casual off-road rides, drink plenty of beer, have campfires and relax. The whole shebang was meant to take place over a few days but I wasn’t able to get out to Mallorca in time so instead I flew in for the main event at the weekend, a 140km gravel race/ride, open to the public and fully supported with feed stations and (some) route markers. On Friday morning I left behind the most atrocious weather possible – fierce wind, torrential rain, thick grey misery – and arrived that afternoon to sun, warmth, cheap coffee and cheerful bougainvillea. 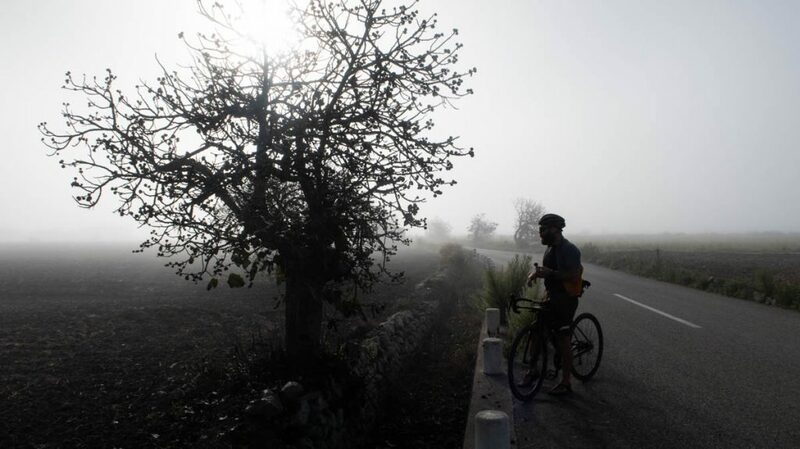 The following morning we adopted a leisurely approach to the race, leaving after everyone and enjoying a peaceful start rolling through fog-shrouded lanes. Turning off the asphalt we enjoyed fast rolling dirt roads passing farmland and finca as we made our way south towards Llucmajor. As the sun began to warm us, we stopped to eat figs, take photos and chat. After a full season of racing and training to a fairly rigid schedule (at least when I was able to get out and ride) it felt like heaven indeed to go slow, chat to my friends and just enjoy the scenery. Luckily for me, my friends Sami Sauri, Kyle Kelley and Benedict (aka Ultraromance) were more than up for that. 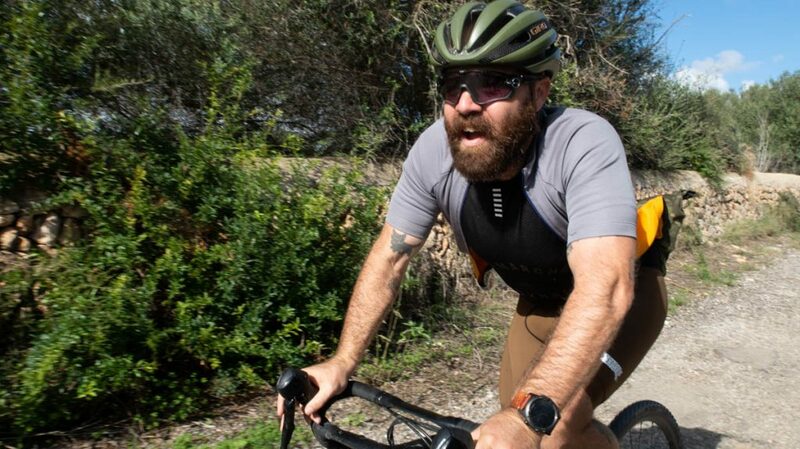 The riding was a mixture of ‘strade bianche’ style hard-packed dirt roads, technical rocky climbs, swooping descents through pine forests and the (very) occasional tarmac section. I was riding a https://www.canyon.com/en-gb/road/grail/, courtesy of the brand themselves who’d deemed the event worthy of their support (and who can blame them) and it felt comfortable and reliable, versatile and capable of handling the rough stuff. We bumbled along as the day heated up, the miles ticking by with that dreamy haze that real good times on the bike have. We weaved through tight paths then began some fun climbs from Campos towards the coast. One steep little beast kicked right up through some trees and involved navigating a couple of boulders about the size of footballs. Only Benedict made it up that section without stopping but I did myself proud on all the other stuff, even when I felt my teeth chattering in my skull on one white-knuckle segment. We made a bit of a navigational error after we missed a sign on a particularly fun descent and had to double back and refind the route – thank god I had the route loaded on the Sigma bike computer I’d been loaned as Sami had disappeared and neither Benedict nor Kyle had battery on their phones. By this point, enjoyable though it was, all thoughts had turned to the beach and we couldn’t wait to get there. When we finally reached the checkpoint and saw the secluded bay, I could barely believe my eyes – the colour of the sand and sea made it look almost tropical. The water was still as a millpond with an outrageous deep turquoise hue, made all the more eye-catching by the bright, almost white sand. I’ve never seen a Mallorca beach before so I wasn’t sure whether we were at the best beach on the entire island but it certainly felt like that. In just one day I saw what felt like a lot of the island, but now, looking back I realise it was only a tiny part of what the Ballearic isle has to offer. When I return (and I will return!) I’m really unsure whether to take a road bike or a gravel one as the gravel riding was some of the best I’ve ever done and I’ve heard the roads get really busy – albeit with cyclists, but still. Perhaps the solution is to go there with one bike and hire the other so I can kill both birds with one stone? As I’ll be taking my family, I think a Mallorca holiday could end up being a firm favourite for the foreseeable future as the place seems to have every single thing I want! Have you been to Mallorca? Are there any other islands that can offer a similar combination of gravel and road cycling, bike hire, group rides, incredible beach and family friendly accommodation? Let me know if the comments below. I visited Mallorca for the first time in August this year. Love it. Rode up the coast to Puerta Pollença then turned and took the false flat to Pollença then up to Lluc. Stopped for a coffee and then down to Inca and back. Later in the holiday I rode the reverse. I tried some gravel and climbedthe hill behind Alcudia to see the sun rise. Sounds brilliant! We were wondering how many bikes we could fit in out bag too. Or whether to take a bike seat that would fit on a gravel bike ,not for gravel riding but for short excursions with the little one when not gravel riding so we could do a bit of everything. Lucky you, living there. What a dream! Maybe you see you in October? I really hope I can come again. Thank you, really nice to hear you’re enjoying the content. Cheerio!